I had an email from Urban Poling indicating these poles will be released for sale this Friday August 22nd 2008. Go to their site for further info. 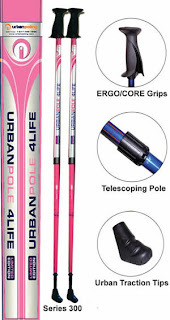 ***NEW *** Urban Poling - 4LIFE "Limited Edition"
When ready to Checkout please click on the "Checkout" button on this page or your can order by phone please call our toll free: 1 877.499.7999. The ERGO/CORE strapless handle is designed to more effectively target major core muscles (One mile of walking equals 1800 abdominal muscles contractions and 900 of lateral back muscles). The ergonomic handles drastically absorb shock and vibration when poling on city surfaces reducing the transfer of energy directly into your arms, preventing joint injuries. Our one size fits all telescoping poles with a premium locking system is the perfect travel companion and space saver. Ideal for individuals between 4’2” and 6'2" in height. Unlike other fix length poles on the market the variable length can be easily adjusted to each person’s body proportions and is ideal for perfecting the basic training technique, users can also adjust the poles depending on the terrain.